Hi friends! Today we are going to use our water-based markers to stamp. You can use any water-based (watercolor) markers you have, even the kids crayolas but you will get better results with a stampers brush tipped marker but use what you have! Today’s video is sponsored by, and features stamps from ArtNeko (formally About Art Accents) they specialize with Asian themed stamps, papers and embellishments and their designs have a timeless elegance that never goes out of style. ArtNeko has a special for Stamp School attendees, 10% off ANY order or free shipping on orders over $50, which ever is greater, they will refund you the discount if you mention The Frugal Crafter when you order.The stamps I am using today are from the Marine 1 set. All you need is white cardstock, markers and adhesive. You might want to try stamping on glossy photo paper if you have any and you also might want a small paintbrush and water if you need to fix any stamped areas. Let’s get on to this weeks lesson on Using markers to stamp! 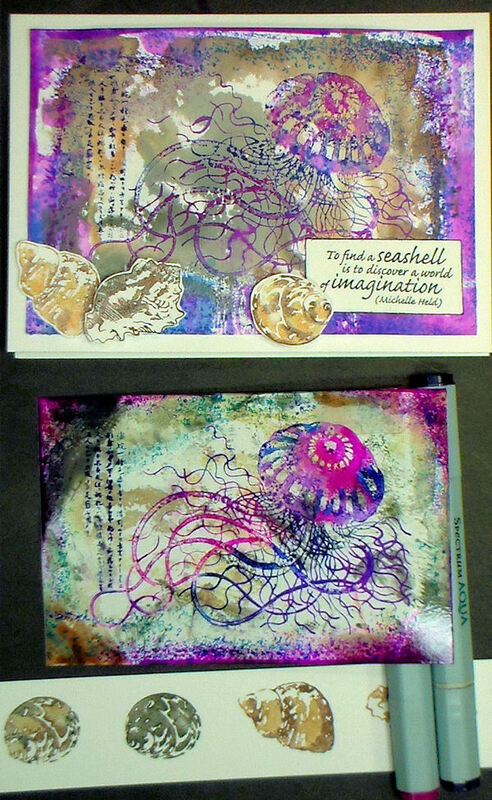 Here is a look at the difference between stamping on the glossy photo paper and the plain cardstock. The photo paper is on the bottom. Be careful using clear stamps on photo paper, do not leave the stamp on the paper long or the paper might stick to the stamp for good! I hope you enjoyed this weeks Stamp School Class! Make sure to join us next week when we will do some coloring with our watercolor markers. 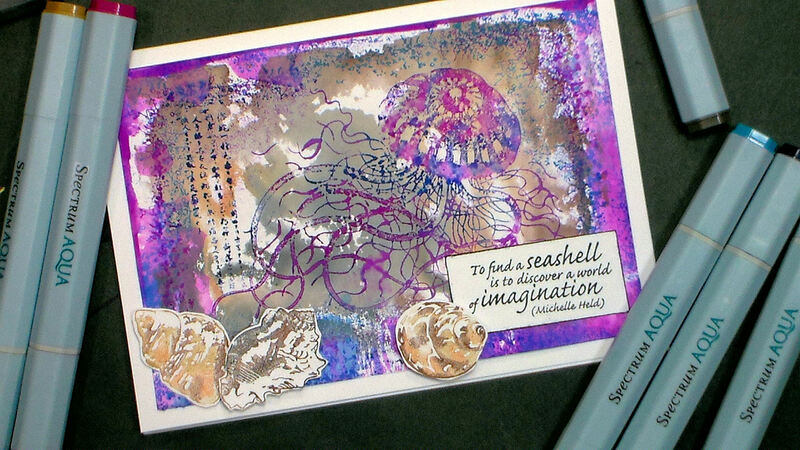 You will want a “line work” type stamp with plenty of room to color. If you missed the first two Stamp School classes they can be found here. Thanks for stopping by and til next week Happy crafting!